“Excuse me, sir, do you have any small travel trailers that look like the Iron Giant?”. That’s how all first sentences should start, especially if you’re in the market for the Bowlus Road Chief All Terrain Camper. When it comes to trailers, we like to think that we know a thing or two about what’s good, and what’s…well not so good. We’ve covered everything from the off grid trailer right through to the downright futuristic off road trailer from out of space! 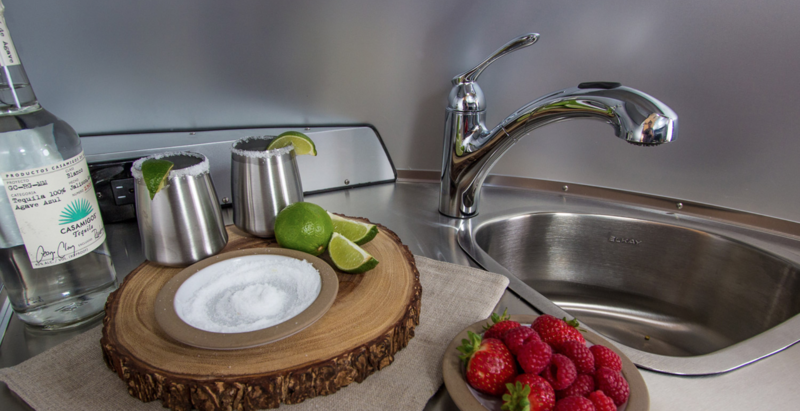 But anything that looks remotely like an Airstream trailer always gets our attention – could Bowlus be about to knock the competition off the top spot? First impressions of this all terrain camper are that it looks like a more streamlined version of the Airstream Basecamp Trailer, one of our most favourite and affordable little trailers on the market. But when you get a little closer, you start to realise that the Bowlus Road Chief is a bit of a wolf in sheep’s clothing. A closer look reveals small panels with an outdoor shower and extra storage that’s cleverly hidden away in the campers exterior. If I then told you that the shower can be used both outside and inside the trailer, you start to get the idea that there’s more than meets the eye with this shiny little treasure trove. Let’s give you a little bit about the camper itself before we delve headfirst into the inside. 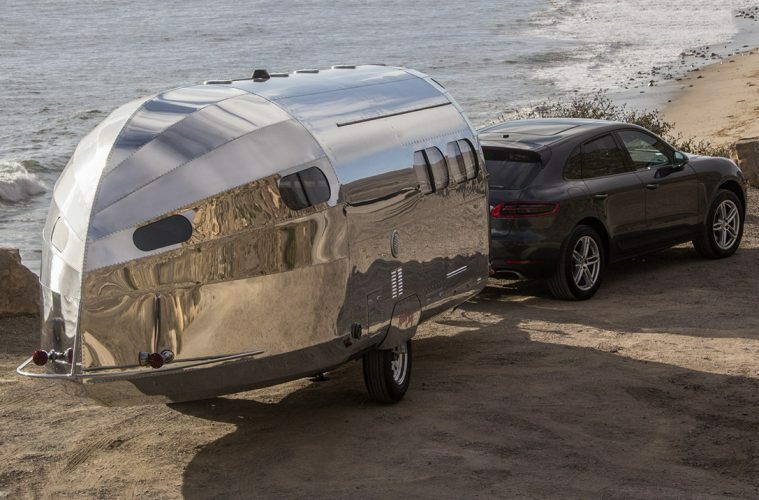 The Bowlus Road Chief ‘On The Road’ edition is perhaps the most aerodynamic trailer ever built, reducing drag on those long rides down the highway while looking funky-fresh every step of the way. The polished aircraft strength aluminium exterior and frame gives the camper a lightweight but sturdy build, and the thermal barrier between the outside and the inside of the camper provides extra warmth and sound insulation. 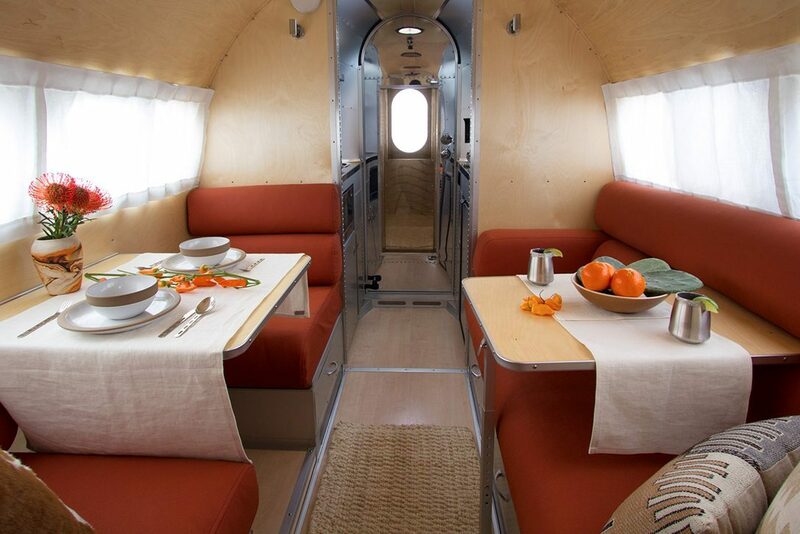 With an exterior length of just under 26 feet and a width of 80 inches, it’s slap bang between the larger airstream and other tiny homes like the Basecamp or the Timberleaf Pika. It’s towable by pretty much any vehicle and has a hallway though, which are plus points in anyone’ss book. Need any more reason to buy it? Ok, scroll down and check out the inside! What’s Inside This All Terrain Camper? Yes, this is the inside of the all terrain camper above. Amazed right? We thought that you would be. It’s just a fact that the words ‘all terrain camper’ don’t necessarily make you think of 5-star luxury and an EarthRoamer style dining area with twin tables! Half first class train compartment, half hotel suite, the Bowlus Road Chief looks very stylish on the inside. Wooden walls contrast the outer aluminium casing nicely, creating a warm and cosy home from home that you can rely on day in day out on the trail. This all terrain camper has a separate en-suite bathroom and a hotel style shower room which is big enough for you to wash your kids, plates, dogs and cats all at the time. Bowlus have included a system that gives you continuous running water which is great for life living off the grid and an indoor clothesline for drying off your adventure gear even when it’s raining outside. There’s also full size his and her closets too! It’s like a hotel on wheels. The large side windows fill the camper with lots of natural light, but with a 2000W Pure Sine inverter as standard, you can afford to bring a few table lamps along for the ride too! The sofa and chairs fold down into beds, making this camper capable of sleeping four people comfortably. Show Me Where The Magic Happens! No, we don’t mean what you’re thinking about. We’re talking about the food! 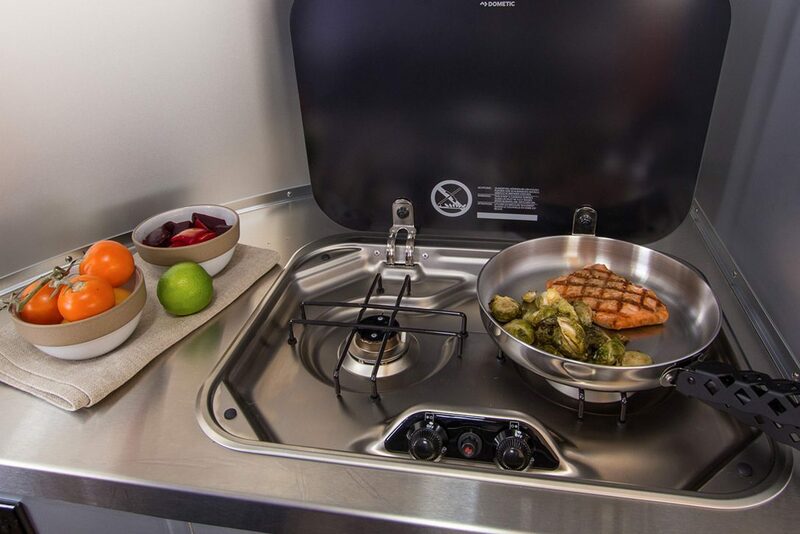 This all terrain camper doesn’t skimp out on top cooking accessories, giving you access to a 2 Burner Italian Cooktop as standard (which is bound to make you cook better!). There’s also a 12V fridge freezer combo, a microwave, lots of cupboards and drawers for storage, as well as the compulsory fire extinguisher for when your cooking gets a little too adventurous. We’ve said it before, and we’ll say it again; just because you live in a van it doesn’t mean that you can’t eat well! There’s plenty of things going on in the background of this All Terrain Trailer too. A silent hydronic heating system has been fitted to keep you nice and warm, and also warms your water in the kitchen and for your outdoor shower. It’s all monitored by a computer too, giving you complete control of all of your settings at the touch of a button. No, it doesn’t, although the shape of the tail end of the camper does mean that you’ll be sleeping apart if you’re a couple (maybe don’t rent this for your honeymoon). It does, however, give you access to a central charging point and creates space for hot air to circulate around the room. The memory foam mattresses will be well received after a long day out in the wilderness too; they’re making us yawn just looking at them! If you’re looking for places to charge up on the go, then there are points everywhere in this all terrain camper, including a full charging station underneath the dining room table. It’s so high tech that you can even create your own private WIFI Network via External WIFI Networks, or via the Cellular Networks with an Added SIM card. You can get all your battery information on your devices via Bluetooth too! With enough space to hold 19 gallons of fresh water, a furnace, an interior height of almost 6.5 foot and more electrical facilities than a power plant, it’s the perfect off-grid home for anyone who’s looking to get away from it all. Just to clarify, when we say ‘all’, we mean as far away as you can possibly get, even if there aren’t any roads heading in that direction! Hook up to the campsite or go off grid with the optional solar panel if you’re after the top eco campers award. Whatever way you choose, you can be safe in the knowledge that you’re heading out in a luxury camper that knows no bounds. But how much does it cost? The Bowlus Road Chief all terrain camper starts at 185’000 dollars, making it a little inaccessible if you’re just after a small trailer to take out on weekends. If you’ve got money to burn, or perhaps if you’re contemplating a long-term trip then we’d recommend thinking about purchasing a road chief for that added bit of luxury on the road. Take a look at Bowlus Road Chief online for more information! Check out our Van Life Essentials list before hitting the road. Be the next James Bond with the Titan Underwater Drone. Looking for gift ideas? Our Campervan Gifts guide has all of the best tech and gadgets.